1) I’ve finished my next book – YAY! – and have submitted it to the publishers. It’s a whole new story, not the sequel to Amber, although I’ve written that too. This is about a girl called Maly Palmer who wants to be an actor. The publishers are happy, which of course makes me happy, and I start working on it with Rachel, my amazing editor, very soon. It’ll be published in 2015. 2) I’m flying to Edinburgh for the book festival next weekend: my event is on Sunday 17 August at 6pm. It’s with Jane Elson, who I met recently, and liked so much. I’m glad to be going and glad to be appearing with Jane. We’ll be discussing her book, A Roomful of Chocolate, my book, Dream on Amber, and dreams of escape. I’m happy to be escaping myself – Edinburgh in August is kicking. I can’t wait! 3) I’m doing a very different type of event at the Hampstead and Highgate Literary Festival on 14th September. I’ll be talking about story writing and cake baking and looking at recipes. Come along! I’d love to meet you. You won’t be getting any cake though, so don’t get too excited. 4) I’ve had lovely letters and emails, the most recent (and my current favourite) is from Elizabeth in Melbourne (Hi Elizabeth). It’s heart-warming to receive feedback and hear what you think of Amber so don’t be shy – get in touch via the ‘Contact me’ tab if you want to say hi. 5) I did two school visits in July, just before schools broke up for the summer. I visited Frithwood School in Northwood and West Lodge in Pinner, where I talked about Dream on, Amber and variety of other things, like where I get my ideas from, what I did before I was an author, what being an author is like and how to create stories. I also answered lots of intelligent questions even though it was SO HOT and everyone was melting, including me. I love doing school visits and hope to do lots more in the coming year. If you’d like me to come to your school, ask your parents or teachers to look at the ‘School Visits’ tab. I’d be happy to visit your school. If you live in Australia I’d love to come even more but it’s unlikely unless my publisher arranges a book tour. You could always ask. You never know. I live in hope. 6) Amber came out in Italy in July. 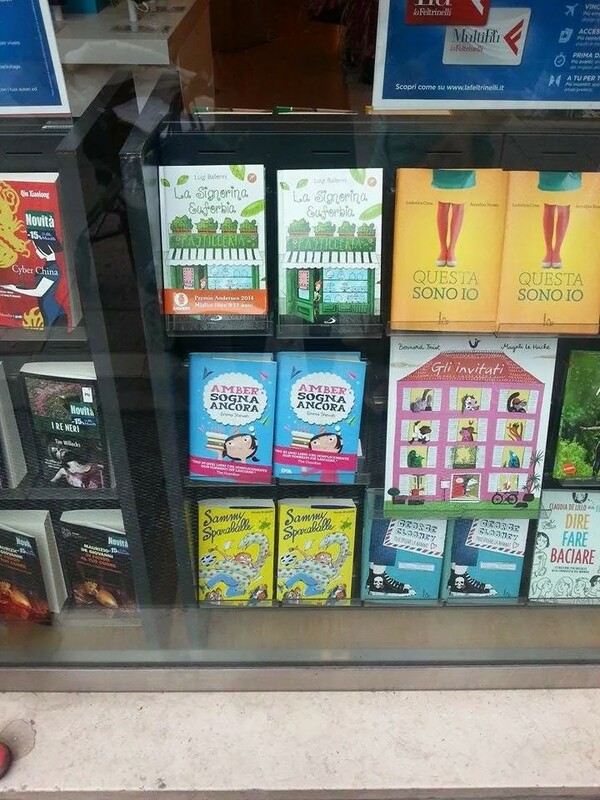 Here it is in a bookshop in Rome. It’s called ‘Amber Sogna Ancora’, which I think means ‘Amber still dreaming’ (but I could be wrong). It’s coming out in Germany at the end of September with a very different cover. 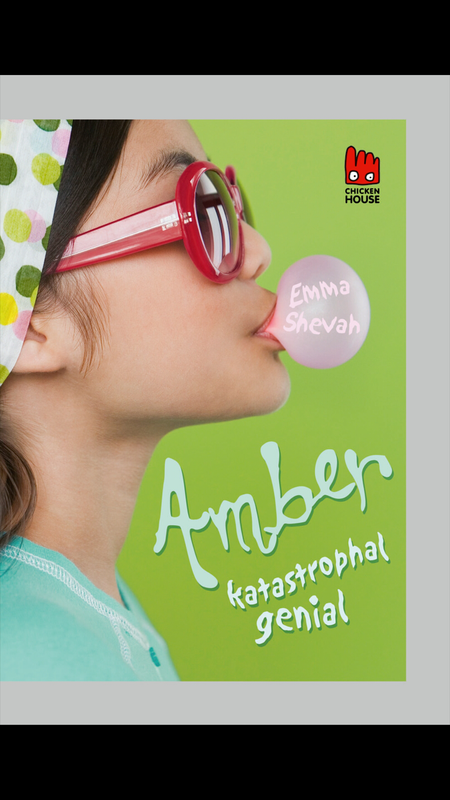 There it’s called ‘Amber Katastrophal Genial’, which means ‘Amber Catastrophe Genius’. I love that my name is inside a bubble gum bubble. That’s it for now. I’ll be in touch after Edinburgh. Wish me luck!